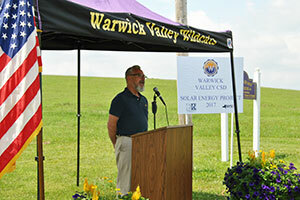 To celebrate the start of construction on its solar power project on the campus of Sanfordville Elementary School, the Warwick Valley Central School District held a groundbreaking ceremony on July 12. In what will soon be the largest school district-owned solar project in New York State, the 2.419 MW solar powered array will generate approximately 2,919,000 Kwh of electricity each year. It will produce enough electricity to offset the district’s entire electricity bill through monetary credits, saving the school district approximately $250,000 a year. While the project cost is approximately $5.7 million, 53.8 percent of that cost will be returned to the district annually, over the next 15 years, through New York State aid. 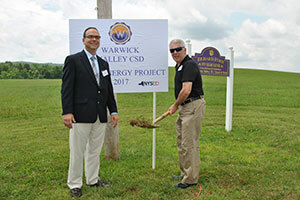 After developing the concept, the Warwick Valley Central School District Board of Education put the project out to bid in the spring of 2015, and ultimately awarded the project to Con Ed Solutions. In July of that year, after nearly a year of research, discussions and meetings, the Board formally approved plans to build a solar field on approximately ten acres of excess property on the campus of Sanfordville Elementary School. The planning process took over two years, and the project was approved by New York State in June, 2016. 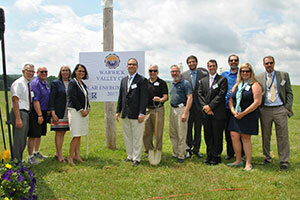 From left: Michael Sweeton, Supervisor, Town of Warwick; John Garcia, BOE member; Rosanne Groff, Coordinator, Office of Facilities Planning, NYS Education Department; Jhone Ebert, Senior Deputy Commissioner, Education Policy, NYS Education Department; Dr. David Leach, WVCSD Superintendent; Tim Holmes, WVCSD Assistant Superintendent for Business; Michael Newhard, Mayor, Village of Warwick; Houtan Moaveni, Assistant Director, NY-Sun, NYSERDA, representing the office of NYS Governor Andrew Cuomo; Keith Parsons, BOE member; Jack Eisenbach, Eisenbach & Ruhnke Engineering; Sharon Davis, BOE member; Mark Ruhnke, Eisenbach & Ruhnke Engineering. Construction began this week. The project will not displace any playground or athletic areas, and the cross country track will be maintained around the solar field. For the safety of students, and to protect the solar panels, the project includes security cameras and fencing around the panels. In addition, trees will be planted along Sanfordville Road. 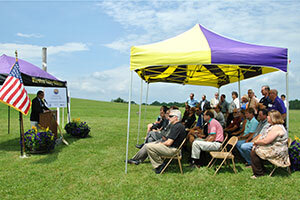 The solar project is part of an Energy Performance Contract (EPC), approved and aided by the State. It will also qualify for incentives through New York State Energy Research & Development Authority (NYSERDA). As an EPC, the project is required to pay for itself within an 18 year period. The project contract includes a materials warranty and grounds maintenance warranty over the 18 year life of the project. The development of renewable energy sources is encouraged and supported by New York State Governor, Andrew Cuomo. Overall, state-supported solar power in New York has increased nearly 800 percent from December 2011 to today. 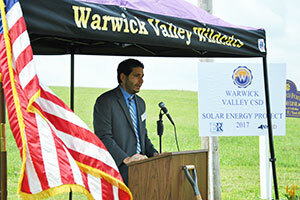 The groundbreaking ceremony marked the start of construction on the solar project, one of several green initiatives the Warwick School District has undertaken over the past few years. Other environmental projects include purchasing propane school buses, updating building lighting to LED, installing a district environmental food waste disposal system, installing a rain garden at the high school, increasing the number of school recycling programs, introducing green education programs for students, and adopting a district sustainability policy. 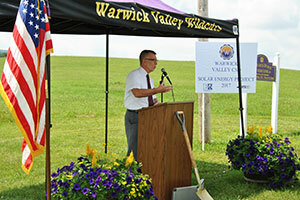 In addition to WVCSD Board of Education members, administrators and staff, community leaders and local business owners, the solar project groundbreaking ceremony was attended by Michael Sweeton, Supervisor, Town of Warwick; Michael Newhard, Mayor, Village of Warwick; Houtan Moaveni, Assistant Director, NY-Sun, NYSERDA, representing the office of NYS Governor Andrew Cuomo; Rosanne Groff, Coordinator, Office of Facilities Planning, NYS Education Department; Jhone Ebert, Senior Deputy Commissioner, Education Policy, NYS Education Department; and representatives from Eisenbach & Ruhnke Engineering and Con Edison Solutions.